Behavioral Neuroscience, Psychobiology, Learning and Memory, Functional Neuroimaging, Brain Stimulation. PROSPECTIVE STUDENTS: I would like to recruit a new Ph.D. student interested in neurocognitive enhancement and mental health. An honors graduate of Tulane University, New Orleans, Louisiana, Francisco Gonzalez-Lima received a B.S. in Biology in 1976 and a B.A. in Psychology in 1977. His Honors Thesis was supervised by Drs. Janis L. Dunlap, Arnold A. Gerall and Joan C. King. Dr. King’s teachings, in particular, motivated him to study the brain. During his last summer at Tulane he worked in the neuroendocrinology laboratory of Dr. Andrew V. Schally, who later that year earned a Nobel Prize. The enriching research experiences at Tulane convinced him to pursue a research career. While being recruited to continue studies at Tulane, he met Dr. Sven O.E. Ebbesson, a former Tulane neuroanatomy professor, who recruited him in a visit to Puerto Rico where Dr. Ebbesson was the new director of the medical sciences graduate program. In 1980 he received a Ph.D. in Anatomy and Neurobiology from the University of Puerto Rico School of Medicine, San Juan. Dr. Gonzalez-Lima was introduced to electrophysiology by Dr. Jose del Castillo, director of the Laboratory of Neurobiology, co-discoverer of quantum transmitter release (del Castillo and Katz--that led to a Nobel Prize to Katz), and a disciple of the Spanish school of Santiago Ramon y Cajal, founding father of modern neuroscience. Dr. Gonzalez-Lima’s research philosophy from thereon has been inspired by their example. His doctoral dissertation utilized electrophysiological recording of single cells and electrical stimulation of the brain and was supervised by Drs. James J. Keene, Jose del Castillo, Earl Kicliter, Hilda Lopez and Walter L. Stiehl. At the age of 24, Dr. Gonzalez-Lima was appointed Assistant Professor of Anatomy at the newly formed Ponce School of Medicine, Ponce, Puerto Rico. He became part of the founding faculty that developed the curriculum and laboratories that brought U.S. accreditation to this medical school in 1980. He taught under the guidance of Dr. Walter L. Stiehl, director of the Department of Anatomy, who became his beloved mentor and research collaborator. Their most important work was published in a series of papers in the European Journal of Pharmacology. In 1981 he met the German Professor Henning Scheich in a study at the Caribbean Primate Research Center involving the newly developed 2-deoxyglucose autoradiographic method. Dr. Gonzalez-Lima was fascinated by the power of the neuroimaging approach to brain research and proposed an ambitious collaborative research project to Dr. Scheich. His resourceful work in the primate study led Dr. Scheich to invite him to go to Germany and sponsored his application to the prestigious Alexander von Humboldt Foundation. Special arrangements were made with Ponce School of Medicine so that Dr. Gonzalez-Lima could pursue postdoctoral research training in Germany as a Humboldt Research Fellow in 1982-83. This period in Germany at the Technical University of Darmstadt was a productive career experience that led to a very successful series of studies published mainly in Brain Research. After returning from Germany in 1983, Dr. Gonzalez-Lima was promoted to Associate Professor. His fruitful collaboration with Professor Scheich continued in follow-up trips to Germany sponsored by the German Science Foundation (DFG), in August-October 1984, October-December 1985 and August-September 1989. Their pioneering studies in animals, using a brain marker known as fluorodeoxyglucose or FDG, contributed for developing the FDG neuroimaging method in humans using positron emission tomography. At the Cajal Conference on Neurobiology in Madrid, Spain, September 1984, Dr. Gonzalez-Lima met Texas professors who were impressed by his brain research with FDG autoradiography. He was recruited to the new College of Medicine of Texas A&M University, where he became Assistant Professor in the Department of Anatomy and Neurobiology in January 1986. After he was recommended for promotion in 1989, the University of Texas at Austin recruited Dr. Gonzalez-Lima and he joined the new Institute for Neuroscience and the Department of Psychology as Associate Professor with tenure in January 1991. Dr. Gonzalez-Lima started an exciting revolution in brain metabolic mapping of learning functions, publishing the first neuroimaging studies of Pavlovian conditioning, behavioral habituation and sensitization, and the first book on brain imaging of learning and behavioral functions (Gonzalez-Lima et al, NATO ASI Vol. D68, 1992). This book was based on the first international conference on this topic that he organized with sponsorship from NATO and NSF. In 1992, his graduate student A. R. McIntosh and he published a report of the first application of structural equation modeling to neuroscience. This led to a series of pioneering papers on the use of path analysis in neuroimaging that culminated in them organizing an international symposium and the first edited volume on this subject (Gonzalez-Lima and McIntosh, Human Brain Mapping Vol. 2, 1994). After 1992, Dr. Gonzalez-Lima and his trainees published a series of studies with their new cytochrome oxidase method, the first enzyme histochemistry method allowing full quantification in terms of calibrated activity units. This approach led to numerous successful studies of cerebral energy metabolic capacity in various species and in Alzheimer’s disease patients, and to the organization of an international symposium and the first book on this subject (Gonzalez-Lima, 1998). In 1997 Dr. Gonzalez-Lima became Professor and Head of Behavioral Neuroscience, and built this area by recruiting four new assistant professors. In 1999 he received joint appointment as Professor in the Division of Pharmacology and Toxicology. In 2000 Dr. Gonzalez-Lima received offers to become director of two neuroscience centers, but he stayed at Austin where he was honored with the first endowed position named after a Hispanic professor in the USA, the George I. Sanchez Centennial Professorship in Liberal Arts and Sciences. In 2002 Dr. Gonzalez-Lima became Director of the Texas Consortium in Behavioral Neuroscience, a multi-million dollar doctoral and postdoctoral research training consortium of five Texas universities. In 2007 he was honored with the Distinguished Alumnus Award from his alma mater. In 2008 Dr. Gonzalez-Lima and his trainees published the first animal study of transcranial photonic stimulation of cytochrome oxidase, and this was followed by a series of studies that culminated in 2013 in the first controlled study demonstrating that transcranial infrared laser stimulates human cognitive and emotional functions. In 2012 Dr. Gonzalez-Lima became the founding Chair of the Neuroscience section of the Texas Academy of Science and USA Councilor of the International Behavioral Neuroscience Society. In 2015 Dr. Gonzalez-Lima was honored with the Distinguished Texas Scientist Award. In 2017 he became Academic Director of the Texas Academy of Science, and received joint appointment as Professor of Psychiatry in the new Dell Medical School. 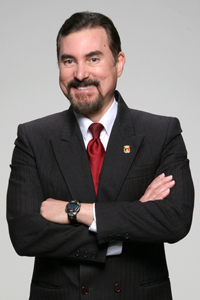 Dr. Gonzalez-Lima has been an invited lecturer at over 120 institutions (in Europe, USA, Canada, Latin America and Asia) and has served on national and international scientific advisory committees (including the International Affairs Committee of the Society for Neuroscience and US National Academy of Science Committee to the International Brain Research Organization). His laboratory has been at the forefront of metabolic studies of animal neurobehavioral functions in the world, translating new interventions for human neurobehavioral disorders and contributing over 400 scientific publications (in peer-reviewed journals, conference proceedings and books). Neuroscientific study of behavioral functions: fundamental structure and function of the human nervous system, sensory systems and perception, motor systems and behavior, motivation and learning, brain disorders and maladaptive behavior. Three lecture hours a week for one semester. Prerequisite: For psychology majors, upper-division standing and Psychology 301 and 418 with a grade of at least C in each; for nonmajors, upper-division standing, Psychology 301 with a grade of at least C, and one of the following with a grade of at least C: Biology 318M, Civil Engineering 311S, Economics 329, Educational Psychology 371, Electrical Engineering 351K, Government 350K, Mathematics 316, 362K, Mechanical Engineering 335, Psychology 317, Sociology 317L, Social Work 318, Statistics 309, Statistics and Scientific Computation 302, 303, 304, 305, 306, 318. Office hours: Tuesdays and Thursdays 2:30-3:30 PM, at SEA 3.236 Tel. 475-8497. Objective: In this class we will examine the anatomical and functional organization of the human brain, emphasizing functional aspects of various neural systems, neuroimaging and translational research topics of clinical relevance. Both a conceptual understanding of central nervous system organization and the necessary memorization of specific neural structures and pathways will be required at the levels of macroscopic (MRI) and microscopic (histology) anatomical analysis. Interactive course format: The course will be devoted to lectures and computer labs, student presentations and two exams (midterm and final). 1. Lectures: will be presented by the professor based on the assigned reading and internet resources. Assigned readings are due before the lectures. 2. Computer labs: are for the students to work on the internet tutorials under the guidance of the professor. Lab tutorials are assigned as homework after each topic. 3. Presentations: one or more students will be discussants of an assigned clinical example in one of the topics listed below. Each student should talk for 2-5 minutes introducing the example, including always neuroimaging findings, and raising translational research questions to stimulate a brief discussion on the topic before the computer labs. Evaluation: Exams will be based mainly on lecture and lab material and discussions. There will be two objective exams, a midterm exam (35% of grade) and a final exam (40% of grade). Students will also be responsible for attendance to lectures and completion of computer labs, presentations and participation in discussions and professional ethical conduct at all times (25% of grade). Percent ranges for grades: A 100-94, A- 93-90, B+ 89-86, B 85-83, B- 82-80, C+ 79-76, C 75-73, C- 72-70, D+ 69-66, D 65-63, D- 62-60, F below 60%. Required book chapters from: L. Heimer, The Human Brain and Spinal Cord, Springer-Verlag, New York/Berlin. First or second editions are fine. (Optional 1st edition course packet for sell on demand at IT Copies, 512 W. MLK St., 476-6662, price $31.41). For students with disabilities, I am available to discuss any appropriate academic accommodations that might be necessary for this course. Before course accommodations are made, a student may be required to provide documentation to the Office of the Dean of Students – Services for Students with Disabilities. They can be reached at 471-6259. Sixty percent of the total grade will come from two partial exams. Three partial exams will be given and the lowest grade will be deleted. If you miss an exam, that exam will be the exam deleted; no make-ups will be given. A comprehensive final exam will account for the other 40% of the total grade. No make-up will be given for the final. Grades: A 100-93, A- 92-90, B+ 89-86, B 85-83, B- 82-80, C+ 79-76, C 75-73, C- 72-70, D+ 69-66, D 65-63, D- 62-60, F below 60%. Exams will consist of multiple-choice questions. Half of the questions will come from material presented in lectures, and half will come from the chapters assigned in the textbook. You will be responsible for lecture material even if it is not in the text, and you will be responsible for assigned chapters even if they are not discussed in the lectures. No communication will be allowed during the exams. All institutional rules on Student Services and Activities (UT publication No. 9009) will be enforced; in particular, the rules on Scholastic Dishonesty (Appendix C). Failure to follow these rules, as determined by the professor, will be sufficient cause to assign an F grade. Date, time: Fridays 2-5 P.M. at ARC seminar room 2.204. Office hours on Fridays 12-2 P.M. at ARC 3.110. Students are encouraged to meet with the professor to prepare for class presentations. Objective: In this advanced research seminar we will discuss the neuroanatomical systems and metabolic processes that are functionally related to basic forms of learning and memory in mammals and how they relate to mental disorders. Topics will include ongoing doctoral dissertation research and the most recent journal articles of assigned research topics. Evaluation: Students will be responsible for studying the reading assignments before class meetings, class attendance, participation in discussions and professional conduct at all times (25% of grade). Each student will select a paper and lead the discussion on it in an oral presentation reviewing studies in one of the topics in the books listed below. This presentation should be well rehearsed before class, illustrated with audiovisual aids as handouts and scholarly conducted (25% of grade). One week ahead of the presentation time, the student will hand copies of an outline of the paper to the professor and to the students. Following the presentation the student is expected to provide a revised version of the paper based on the class feedback and comments. The revised student's paper will be 50% of grade. There is no curve. Grades: A 100-93, A- 92-90, B+ 89-86, B 85-83, B- 82-80, C+ 79-76, C 75-73, C- 72-70, D+ 69-66, D 65-63, D- 62-60, F below 60%. Martinez Jr., J. L. & Kesner, R. P. (eds.) Neurobiology of Learning and Memory, Academic Press, San Diego, 600 pp., 2007. Gonzalez-Lima, F., Finkenstädt, Th., & Scheich, H. (eds.) Advances in Metabolic Mapping Techniques for Brain Imaging of Behavioral and Learning Functions, Dordrecht/Boston/London: NATO ASI Series D: Vol. 68, Kluwer Academic Publishers, 527 pp., 1992. Prerequisites: Graduate standing and consent of instructor. One course in neuroscience and one course in learning, or approval of equivalent background by professor. 75-73, C- 72-70, D+ 69-66, D 65-63, D- 62-60, F below 60%. and half will come from the chapters assigned in the textbook. even if they are not discussed in the lectures. to assign an F grade. the total grade. No make-up will be given for the final. Dean of Students at 471-6259, 471-4641 TTY. Seminars in Behavioral Neuroscience and Biopsychology. Three lecture hours a week for one semester. May be repeated for credit when the topics vary. Prerequisite: Graduate standing and consent of instructor. Mark F. Bear, Ph.D., Barry W. Connors, Ph.D., Michael A. What advice would you give to a Behavioral Neuroscience student? entirely at home in this class. pertinent questions about course material or reading assignments. How can students maximize their Behavioral Neuroscience experience? opportunities for learning and growing. Seek out and welcome those opportunities. stretch your talents and help you explore your interests. Neuroscientific study of behavioral functions: fundamental structure and function of the human nervous system, sensory systems and perception, motor systems and behavior, motivation and learning, brain disorders and maladaptive behavior. Three lecture hours a week for one semester. Prerequisite: For psychology majors, upper-dvision standing and Psychology 301 and 418 with a grade of at least C in each; for nonmajors, upper-divsion standing, Psychology 301 with a grade of at least C, and one of the following with a grade of at least C: Biology 318M, Civil Engineering 311S, Economics 329, Educational Psychology 371, Government 350K, Mathematics 316, Psychology 317, Sociology 317L, Social Work 318, Statistics 309.